I'm happy to report that I added another make to my Maternity wardrobe! With our new book coming out we get to go to Quilt Market this month to show off all our projects at a Schoolhouse presentation. I'm so excited! 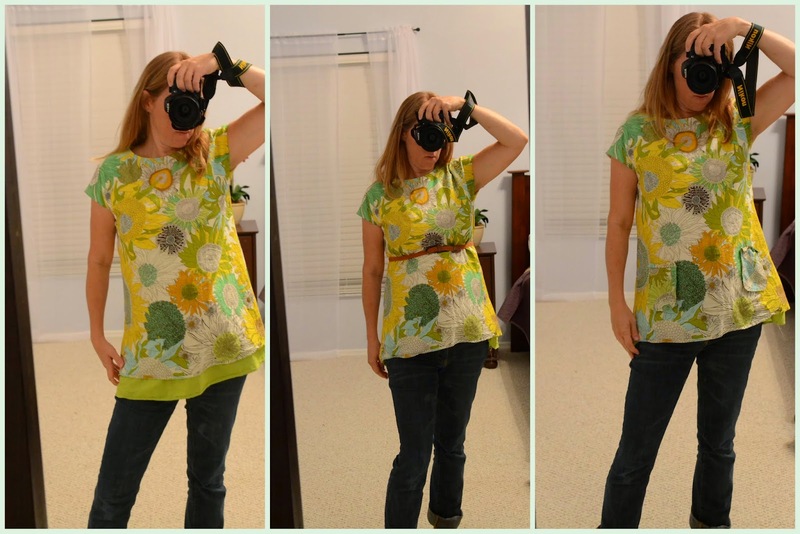 Of course it's the perfect time to wear some of our projects throughout the weekend too so I decided to make another version of the Saturday Night Tunic just for me! This pattern is designed by Caroline of SewCanShe and is actually on the front cover of the book. It already has a slightly empire waist so I thought it might be perfect for maternity wear. For the fabric I chopped up Mer's old Liberty of London dress that doesn't fit her anymore. Remember when they had a limited edition line at Target? I wish I bought more! Anyway I couldn't part with this beautiful fabric. It turned out to be the perfect size to cut a tunic from. I opted to keep the bottom hem as is, which saved sewing time. I'm still on the fence about it though, That green might need to be narrower. I decided to not shirr the middle so I could belt it or not. I think it also looks cute and retro not belted. I also considered adding the pockets back on... Decisions, decisions! This is how it sits for now...Any opinions on this? Green hem or no green hem? Oooohhhh la la! I like it! Oh my, I love the green band! This is really a cute top. I like it without the belt. Even though I am years past maternity, I wouldn't want a belt there. Gorgeous re-make. Perfect colors for you.